The Tapestry is a new 55+ community in Garner, North Carolina. When finished, this community will include 99 attached homes and a 2,900 square-foot clubhouse for residents to gather for class, clubs, and parties. This active adult 55+ development will showcase low-maintenance homes thanks to a homeowners’ association (HOA) fee that takes care of chores like mowing the lawn and shoveling the driveway. 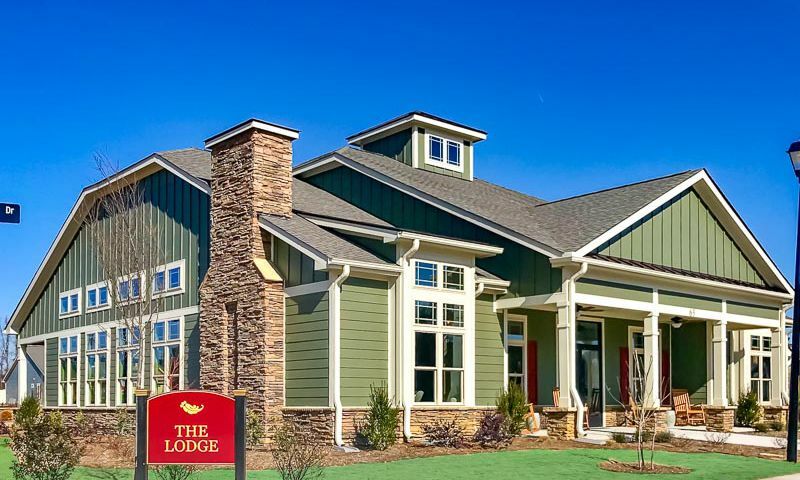 The 2,900 square-foot clubhouse, named The Lodge, will be a great location for residents to gather and enjoy all of the fun amenities this community will offer. It plans to include a fitness studio for residents looking to stay in shape. Residents will be able to prepare snacks before parties in the catering kitchen. A multi-purpose room will be perfect for reading, conducting business, or just surfing the internet. A card room will also be available for playing a game of bridge with neighbors and friends. Outside, the planned amenities will continue with a covered veranda from which you can access walking and biking trails that will take you to a gazebo, BBQ area, fire pit, or the community dog park. For residents with green thumbs, a community garden will be a great place to spend an afternoon. There will be several parks located throughout the community where residents will enjoy a bit of fresh air. Fleming Homes began construction of The Tapestry in 2017. Upon completion, the community will boast 99 attached homes in five distinct floor plans. The homes will range in size from 1,645 to 2,507 square feet. These plans offer two or three bedrooms, two to three bathrooms, and an attached two-car garage. Every home will include thoughtful features like granite kitchen countertops, gas log fireplaces, hardwood flooring in the living areas, and tile bathroom floors. Homeowners at The Tapestry will live a low-maintenance lifestyle full of exciting activities and clubs. From potlucks in the gathering room of the clubhouse to holiday parties, BBQs, and gardening, there will be many things for residents to enjoy. An HOA fee will take care of things like lawn care and exterior home maintenance, so residents will have more time to enjoy all of the clubs, activities, and fun the community has to offer. Located off Interstate 40, The Tapestry is located in Garner, North Carolina, just minutes away from Raleigh. Down the street, residents will find a Food Lion, Walmart Supercenter, and Walgreens for all of their day-to-day needs. When you must travel farther, Raleigh-Durham International Airport is a 32-minute drive from your front door. No matter if you’re just looking to spend a quiet, relaxing afternoon at home, spend time with friends and neighbors enjoying a class or club, or going out and experiencing big-city entertainment, The Tapestry is ideally located in the Raleigh-Durham area for any and all of your needs. There are plenty of activities available in The Tapestry. Here is a sample of some of the clubs, activities and classes offered here. 55places.com is not affiliated with the developer(s) or homeowners association of The Tapestry. The information you submit is distributed to a 55places.com Partner Agent, who is a licensed real estate agent. The information regarding The Tapestry has not been verified or approved by the developer or homeowners association. Please verify all information prior to purchasing. 55places.com is not responsible for any errors regarding the information displayed on this website.